Uma espaçonave robótica é uma espaçonave sem humanos a bordo, que está normalmente sob controle telerobótico. Uma espaçonave robótica projetada para fazer medições de pesquisas científica é geralmente chamada de sonda espacial. Muitas missões espaciais são mais apropriadas para operação telerobótica do que com tripulação, devido ao custo mais baixo e menores fatores de risco. Além disso, alguns destinos como Vênus e Júpiter são muito hostis à sobrevivência humana, com a tecnologia atual. Planetas exteriores como Saturno, Urano e Netuno estão muito longe para serem atingido com a tecnologia de naves tripuladas atual, assim as sondas telerobóticas são a única forma de explorá-los. Muitos satélites artificais são espaçonaves robóticas, bem como muitos aterrissadores e rovers. ↑ K. Schilling; W. Flury (11 de abril de 1989). «AUTONOMY AND ON-BOARD MISSION MANAGEMENT ASPECTS FOR THE CASSINI-TITAN PROBE» (PDF). ATHENA MARS EXPLORATION ROVERS. Consultado em 10 de maio de 2013. Cópia arquivada (PDF) em 11 de abril de 1989. Current space missions exhibit a rapid growth in the requirements for on-board autonomy. This is the result of increases in mission complexity, intensity of mission activity and mission duration. 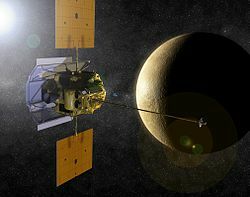 In addition, for interplanetary spacecraft, the operations are characterized by complicated ground control access, due to the large distances and the relevant solar system environment[…] To handle these problemsn, the spacecraft design has to include some form of autonomous control capability. ↑ «Frequently Asked Questions (Athena for kids): Q) Is the rover controlled by itself or controlled by scientists on Earth?» (PDF). ATHENA MARS EXPLORATION ROVERS. 2005. Consultado em 10 de maio de 2013. Cópia arquivada (PDF) em 29 de outubro de 2009. Communication with Earth is only twice per sol (martian day) so the rover is on its own (autonomous) for much of its journey across the martian landscape. Scientists send commands to the rover in a morning "uplink" and gather data in an afternoon "downlink." During an uplink, the rover is told where to go, but not exactly how to get there. Instead, the command contains the coordinates of waypoints toward a desired destination. The rover must navigate from waypoint to waypoint without human help. The rover has to use its "brain" and its "eyes" for these instances. The "brain" of each rover is the onboard computer software that tells the rover how to navigate based on what the Hazcams (hazard avoidance cameras) see. It is programmed with a given set of responses to a given set of circumstances. This is called "autonomy and hazard avoidance." Esta página foi editada pela última vez às 22h38min de 12 de agosto de 2017.